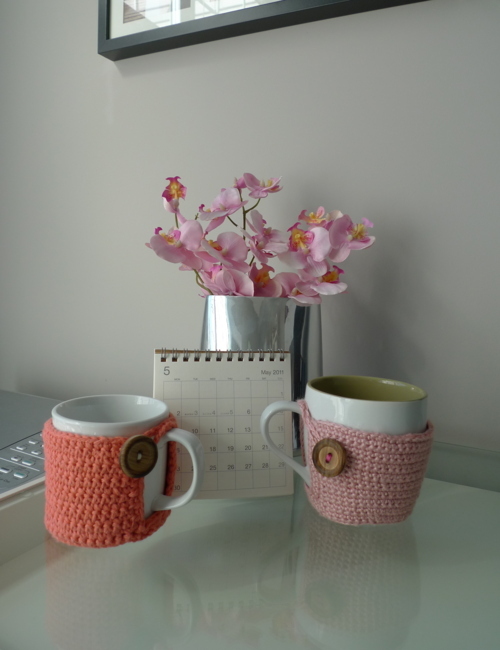 After making these amigurumi cups, I thought I’d try my hand at making some actual cup cozies since I love drinking tea. 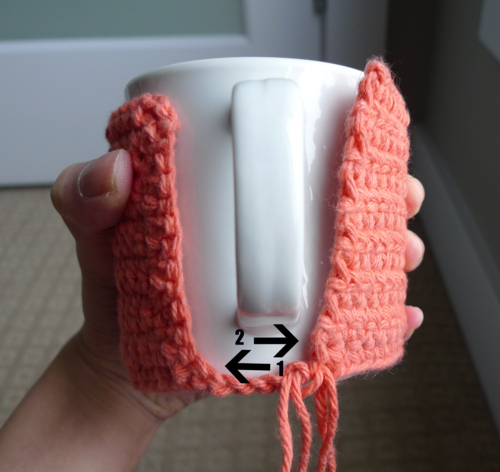 These cup cozies will protect your fingers when your cups get too hot from your warm drinks 🙂 Follow along with my tutorial to make your very own! 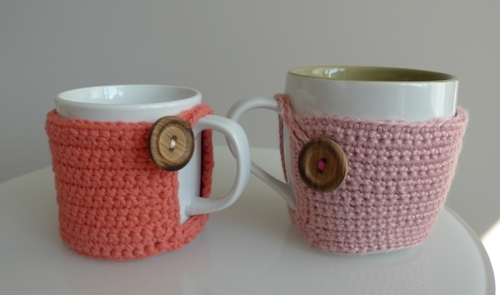 Make a series of chain stitches and measure it around the cup you’d like to use. Make the chain a bit longer than the circumference of the cup. 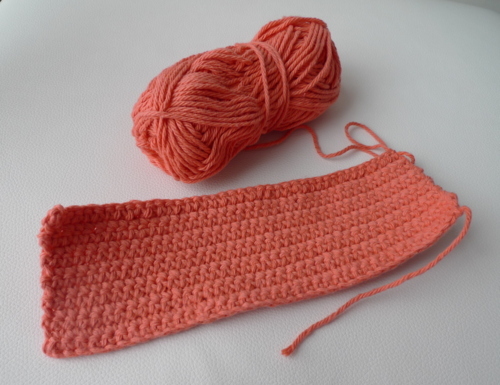 Single crochet along each row until you’ve reached your desired height. 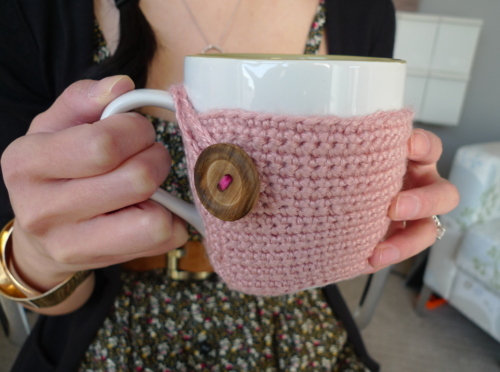 Wrap the crocheted piece around the cup (to visualize where you’ll be crocheting). Make sure that the top edge of the piece has the “v’s” showing outwards (flip if necessary). Single crochet down the left side. 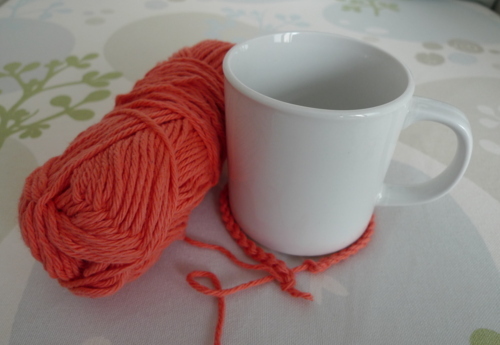 Next, make a series of chain stitches to run across the bottom of the cup. 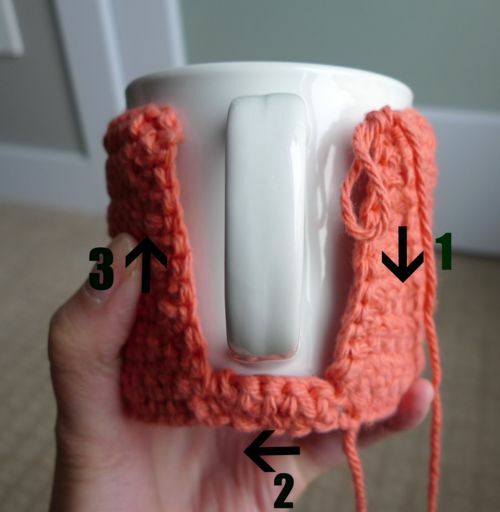 Make sure the cup cozy fits nice and snug, so do not chain too many stitches. Slip stitch to the right side. Single crochet back across from the right side to the left side (1), and then slip stitch to the left side. Then single crochet from the left side to the rght side (2) and then slip stitch to the right side. Next, single crochet up the right side. Now, single crochet down the right side (1), across from the right to the left side (2), and then up the left side (3) to give a decorative touch to all the edges. 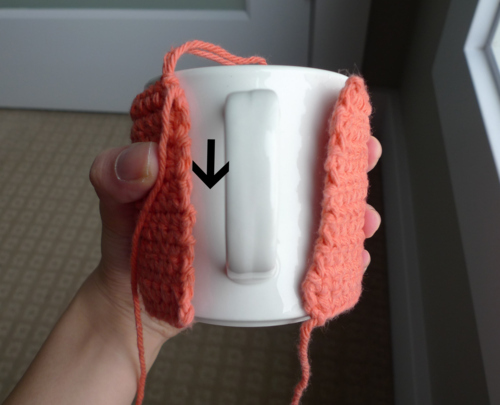 Of course, you can adapt how you crochet around the handle any way you’d like (depending on which side you started on). Sew a button onto one of the sides. Make a loop by chaining stitches on the other side. Measure it to make sure it comfortably and snugly loops around the button. 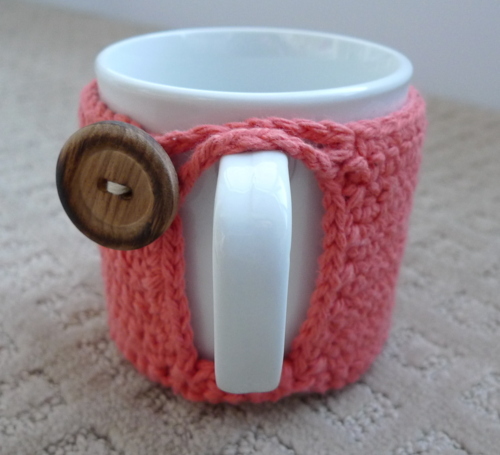 My mom loves drinking coffee and tea, so I wanted to make a cup cozy for her too. I made a few changes to this one since it was my second time around. 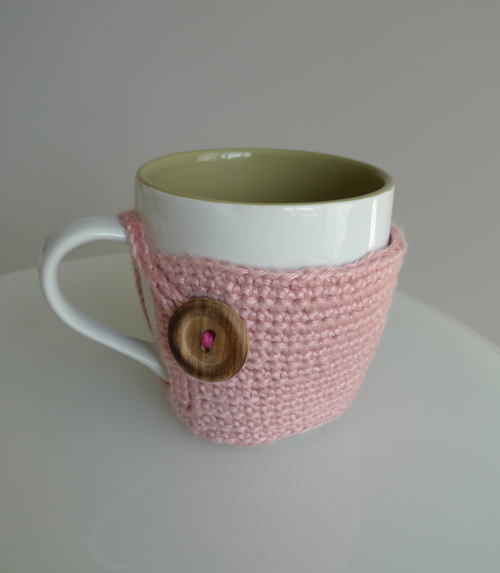 I made the cup cozy lower so that there would be more space for the lips to drink from the cup. 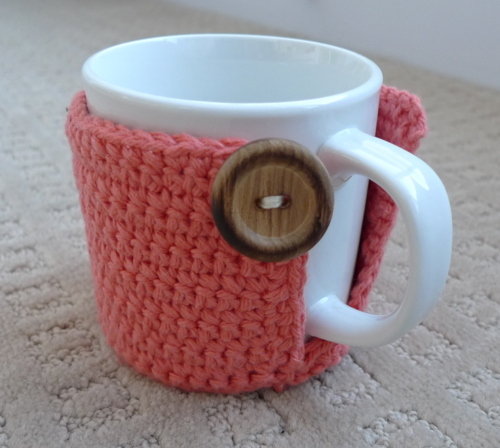 I also chose a cup that was two-toned (light grey on the outside, green on the inside) for colour variation, and I also used a deeper pink thread when sewing on the button for a nice pop of colour. 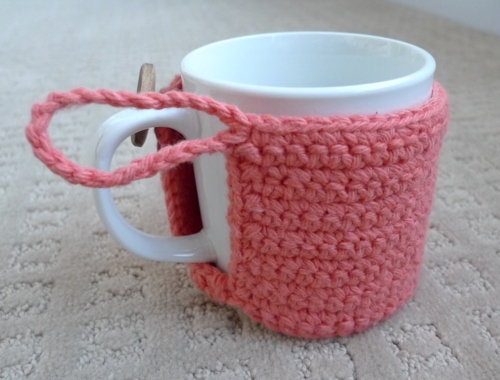 It was somewhat tricky crocheting a cup cozy for this cup since it tapered downwards and was not the same size throughout the height. 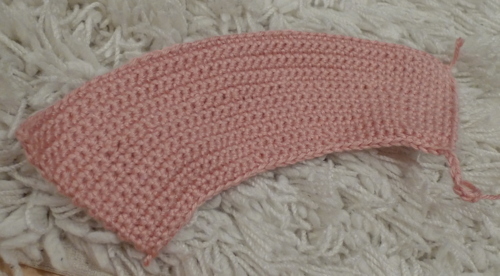 And so, I had to crochet this shape. I started off with the widest length and then decreased some of the rows throughout to accomodate for the tapered shape of the cup. 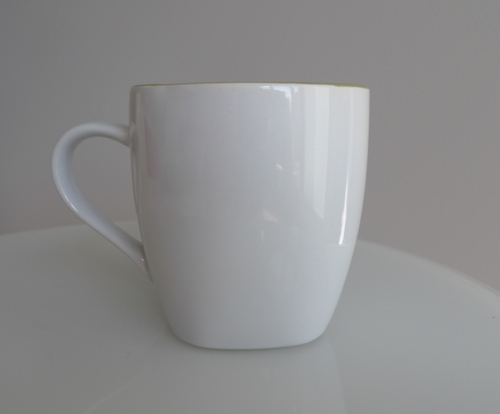 To make life easier, I’d recommend choosing a cup that is the same width throughout. 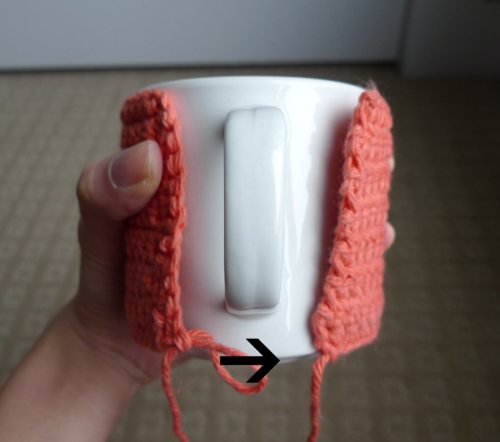 This is how the cup cozy turned out! I followed a similar pattern to join the edges, this time adding a few more rows of single crochets along the sides and the bottom. 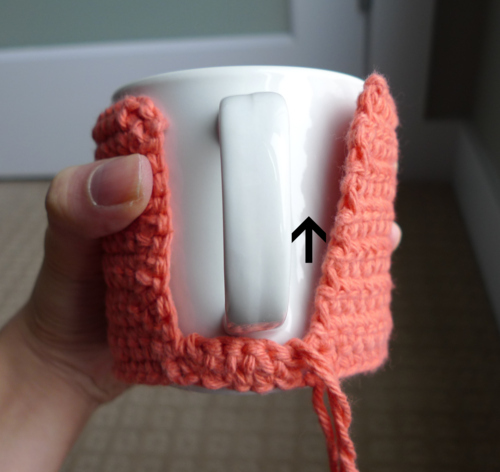 I also placed the button further inwards and downwards to help hold the cup cozy up (otherwise the cozy would slip down). 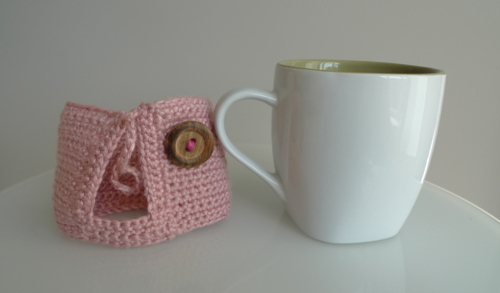 I love the look of the crocheted cup cozies! They look both rustic and kind of modern at the same time. 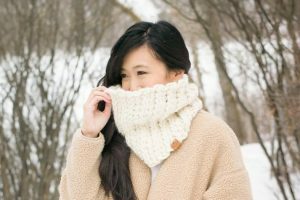 This pattern is an original pattern by Stephanie Lau of All About Ami. Please do not claim this pattern as your own. If you wish to share this pattern, you may link to this pattern but please do not reprint it on your site. You may keep a copy for your own personal use but you please DO NOT sell the pattern or distribute it.